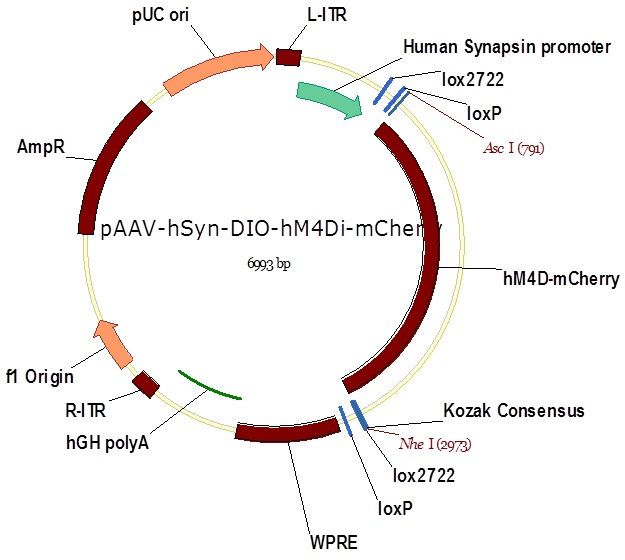 Double floxed Gi-coupled hM4D DREADD fused with mCherry under the control of human synapsin promoter. Ready-to-use AAV2 particles produced from pAAV-hSyn-DIO-hM4D(Gi)-mCherry (#44362). 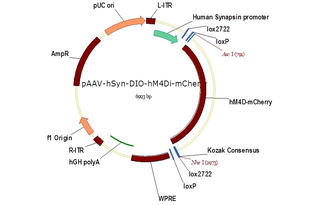 In addition to the viral particles, you will also receive purified pAAV-hSyn-DIO-hM4D(Gi)-mCherry plasmid DNA. hSyn-driven, Cre-dependent, hM4D(Gi) receptor with an mCherry reporter for CNO-induced neuronal inhibition. These AAV preparations are suitable purity for injection into animals. Ready-to-use AAV5 particles produced from pAAV-hSyn-DIO-hM4D(Gi)-mCherry (#44362). In addition to the viral particles, you will also receive purified pAAV-hSyn-DIO-hM4D(Gi)-mCherry plasmid DNA. Syn-driven, Cre-dependent hM4D(Gi) receptor with an mCherry reporter for CNO-induced neuronal silencing. These AAV preparations are suitable purity for injection into animals. Ready-to-use AAV8 particles produced from pAAV-hSyn-DIO-hM4D(Gi)-mCherry (#44362). In addition to the viral particles, you will also receive purified pAAV-hSyn-DIO-hM4D(Gi)-mCherry plasmid DNA. Syn-driven, Cre-dependent, hM4D(Gi) receptor with an mCherry reporter for CNO-induced neuronal inhibition. These AAV preparations are suitable purity for injection into animals. Ready-to-use AAV9 particles produced from pAAV-hSyn-DIO-hM4D(Gi)-mCherry (#44362). In addition to the viral particles, you will also receive purified pAAV-hSyn-DIO-hM4D(Gi)-mCherry plasmid DNA. Syn-driven, Cre-dependent, hM3D(Gq) receptor with an mCherry reporter for CNO-induced neuronal activation. These AAV preparations are suitable purity for injection into animals. Ready-to-use AAV Retrograde particles produced from pAAV-hSyn-DIO-hM4D(Gi)-mCherry (#44362). In addition to the viral particles, you will also receive purified pAAV-hSyn-DIO-hM4D(Gi)-mCherry plasmid DNA. Syn-driven, Cre-dependent, hM4D(Gi) receptor with an mCherry reporter for CNO-induced neuronal inhibition. These AAV were produced with a retrograde serotype, which permits retrograde access to projection neurons. These AAV preparations are suitable purity for injection into animals. Ready-to-use AAV PHP.eB particles produced from pAAV-hSyn-DIO-hM4D(Gi)-mCherry (#44362). In addition to the viral particles, you will also receive purified pAAV-hSyn-DIO-hM4D(Gi)-mCherry plasmid DNA. Syn-driven, Cre-dependent, hM4D(Gi) receptor with an mCherry reporter for CNO-induced neuronal inhibition. These AAV were produced with the PHP.eB serotype, which permits efficient transduction of the central nervous system. These AAV preparations are suitable purity for injection into animals. Citation Information: When using the PHP.eB serotype in future publications, please acknowledge Viviana Gradinaru and Benjamin Deverman and cite Chan et al., Nat Neurosci, 20(8):1172-1179. Pubmed.